100% silk bed line seamless. 100% Silk Sheets Set Seamless. 100% Duvet Cover Set Seamless. 100% Silk Bed Line Set Seamed. 16mm 100% Silk Duvet Cover & Set. 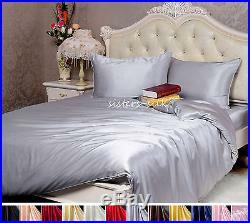 19mm 100% Silk Duvet Cover & Set. 22mm 100% Silk Duvet Cover & Set. 30mm 100% Silk Duvet Cover & Set. 40mm 100% Silk Duvet Cover & Set. 16mm 100% Silk Sheet & Set. 19mm 100% Silk Sheet & Set. 22mm 100% Silk Sheet & Set. 30mm 100% Silk Sheet & Set. 40mm 100% Silk Sheet & Set. 100% Silk Pillows & Blankets. Womens 100% Silk Tops Shirts. Womens 100% Silk Pyjamas Set. Womens 100% Silk Long Johns Set. Womens 100% Silk Robes Gowns. Womens 100% Silk Bras & Set. Men's 100% Silk Clothing. Men's 100% Silk Tops Shirts. Men's 100% Silk Long Johns Set. Men's 100% Silk Pyjamas Set. Men's 100% Silk Robes Gowns. Men's 100% Silk Shorts. Men's 100% Silk Underwear. Silk Eye Masks & Nightcap. 19 momme 100% pure silk seamless duvet cover & fitted sheet & pillow cases & shams bedding linen set. Quantity & detail dimensions wxl(approx). 1 duvet cover 137x200 1 fitted sheet 90x190x35cm 2 pillow case 50x75cm. You can change the pillowcase or shams size with no extra cost. If you want to change the items dimensions, there is no extra. 1 duvet cover 200x200 1 fitted sheet 137x193x35cm 2 pillow case 50x75cm. 1 duvet cover 230x220 1 fitted sheet 152x200x35cm 2 pillow case 50x75cm. 1 duvet cover 260x220 1 fitted sheet 183x200x35cm 2 pillow case 50x75cm. 19 momme 100% mulberry silk. Brand new in package with tags. This bed linen set made of top grade 100% pure mulberry silk charmeuse extra wide fabric, its seamless and luxury. Has little ties downs inside that would attach to your duvet and keep it from moving around inside, and closed with zipper. Made of solid 19 momme 100% silk charmeuse, with elastic on the four corners, to ensure fit it onto the matress firmly. Side zipper closure housewife style, you can use both side. The silk sericin contains 18 kinds of amino acid which distributed to the minor elements is known as the sleep factor. It makes the peoples mental state more stable. Using silk quilt can promote sleeping and enhances vitality of the human body, etc. It has very good thermostatic and cold protection properties. It keeps warm in winter and cool in summer, heat retention than leather, cotton even goose down. It has anti-mite, anti-bacteria and anti-allergy properties. Silk sericin can not only makes human skin smooth but also prevents the growth of mites and mold, making it the best choice for skin allergies. It has moisture resistance properties. Silk contains protein called pro-side chains of amino acids, the material can absorb moisture in the air and to be eliminated. To be maintained silk quilts dry and comfortable, particularly curative for rheumatism patients. It has long fiber characteristics. Silk is long fiber, so it is very difficult to generate dust and have on human respiratory health role, particularly curative for use in patients with respiratory diseases. Detail please refer [about silk] below. How to maintain the silk bedding? Please wash with cold water no more than 40°C. Please don't wash with alkaline detergent, you can use neutral detergent or special silk detergent. Please don't air under strong sun shine. Please iron under 200°C and always move the hot iron. Please don't dry clean. Please send message to us and request a right invoice. You can track your order through your own country's postal service's website if they have an tracking option available online. Silk is a natural protein fibre, some forms of which can be woven into textiles. The protein fibre of silk is composed mainly of fibroin and produced by certain insect larvae to form cocoons. The best-known type of silk is obtained from the cocoons of the larvae of the mulberry silkworm Bombyx mori reared in captivity (sericulture). The shimmering appearance of silk is due to the triangular pris m-like structure of the silk fibre, which allows silk cloth to refract incoming light at different angles, thus producing different colors. Silk fibers from the Bombyx mori silkworm have a triangular cross section with rounded corners, 5-10 m wide. The fibroin-heavychain is composed mostly of beta-sheets, due. To a 59-mer amino acid repeat sequence with some variations. The flat surfaces of the fibrils reflect light at many angles, giving silk a natural shine. Silk has a smooth, soft texture that is not slippery, unlike many synthetic fibers. Silk is one of the strongest natural fibers but loses up to 20% of its strength when wet. It has a good moisture regain of 11%. Its elasticity is moderate to poor: if elongated even a small amount, it remains stretched. It can be weakened if exposed to too much sunlight. It may also be attacked by insects, especially if left dirty. No articles of dress of woollen cloth have yet been found. Silk is a poor conductor of electricity and thus susceptible to static cling. Unwashed silk chiffon may shrink up to 8% due to a relaxation of the fiber macrostructure, so silk should either be washed prior to garment construction, or dry cleaned. Dry cleaning may still shrink the chiffon up to 4%. Occasionally, this shrinkage can be reversed by a gentle steaming with a press cloth. There is almost no gradual shrinkage nor shrinkage due to molecular-level deformation. Natural and synthetic silk is known to manifest piezoelectric properties in proteins, probably due to its molecular structure. Silk emitted by the silkworm consists of two main proteins, sericin and fibroin, fibroin being the structural center of the silk, and serecin being the sticky material surrounding it. Fibroin is made up of the amino acids Gly-Ser-Gly-Ala-Gly-Ala and forms beta pleated sheets. Hydrogen bonds form between chains, and side chains form above and below the plane of the hydrogen bond network. The high proportion (50%) of glycine, which is a small amino acid, allows tight packing and the fibers are strong and resistant to breaking. The tensile strength is due to the many interceded hydrogen bonds, and when stretched the force is applied to these numerous bonds and they do not break. Silk is resistant to most mineral acids, except for sulfuric acid, which dissolves it. It is yellowed by perspiration. Chlorine bleach will also destroy silk fabrics. Silk's absorbency makes it comfortable to wear in warm weather and while active. Its low conductivity keeps warm air close to the skin during cold weather. It is often used for clothing such as shirts, ties, blouses, formal dresses, high fashion clothes, lining, lingerie, pajamas, robes, dress suits, sun dresses and Eastern folk costumes. Silk's attractive lustre and drape makes it suitable for many furnishing applications. It is used for upholstery, wall coverings, window treatments (if blended with another fiber), rugs, bedding and wall hangings. A special manufacturing process removes the outer irritant sericin coating of the silk, which makes it suitable as non-absorbable surgical sutures. This process has also recently led to the introduction of specialist silk underclothing for people with eczema where it can significantly reduce it. To produce 1 kg of silk, 104 kg of mulberry leaves must be eaten by 3000 silkworms. It takes about 5000 silkworms to make a pure silk kimono. The construction of silk is called sericulture. The major silk producers are China (54%) and India (14%). Silk and silk making is a vital feature of Chinese history and its ancient civilization. According to archeological evidence, silk and silk fabric emerged in China at least 5,500 years ago. The cultivation of the silkworm can be traced back to the third century BC. Silkworm raising and cocoon unwinding are now known as silk culture or sericulture. It takes about 25-28 days for a silkworm to grow old enough to spin a cocoon. Then farmers will pick them up and place them one by one onto piles of straws. Then each silkworm, with its legs stretched out, will attach itself to the straw and begin to spin. The next step is unwinding the cocoons. The cocoons are heated enough to kill the pupae, which must be done at the right time; otherwise, the pupas are bound to turn into moths. Moths will make a hole in the cocoon, which makes reeling useless. To unwind the cocoons, they are put into a basin filled with hot water at first. Then the reeling women find the loose end of the cocoons and twist them. Afterwards, the women carry the cocoons to a small wheel for unwinding. At last, two workers measure them into a certain length and twist them into so-called "raw" silk, which then are dyed and woven into cloth. It is a fact that about 1,000 meters can be unwound from one cocoon, while 111 cocoons are needed for a man's tie, and 630 cocoons are needed for a woman's blouse. The fabric made in silk is called silk in general, but the silk can be made into different kinds of fabric depends on different processing, such as SilkCharmeuse, Silk Sang Satin, Jacquard Silk Satin, Silk;Knitting, Silk Crepe, Crepe georgtte, Silk Voile, and so on. Satin fabric made of unboiled mulberry raw silk. With at least five tricot; weft lines in each dense and solid stitch; shiny and smooth in surface, and dull and crepe underside, silk charmeuse is the major category of silk products using the most sophisticated technologies and highest level of process, with the most luxury appearance and extremely soft hand feel. Silk fabric made of unboiled mulberry raw silk in plain stitches, which are the simplest fabric stitches inter-woven by tricot & weft lines. This kind of fabric is solid and straight in texture but insufficient in softness and without luster. Habutai is usually sand washed to improve its softness. Silk charmeuse is of higher value than habutai of the same momme weight (mm). Refer to the process where boiled silk is put into alkaline solution of auxiliary agent containing swelling agent and softener, etc. And is made into a silk product by applying mechanic friction and water flow impact. Sand washed silk has fine and dense floss on the fabric surface, resulting in very soft and smooth hand feel, thick and spongy fullness, high elastic resilience, strong vivacity of the fabric rib, and other remarkable features. The true reason behind the improved softness is that the fall of the fabric has been boosted after sand washing. Mommes (mm) are units of weight traditionally used to measure the surface density of silk. It is akin to the use of thread count to measure the quality of cotton fabrics, but is calculated in a very different manner. Instead of counting threads, the weight in mommes is a number that equals the weight in pounds of a piece of silk if it were sized 45 inches by 100 yards. This is because the standard width of silk is 45 inches wide, though silk is regularly produced in 55-inch widths, and, uncommonly, in even larger widths. Silk can also be measured by weight in grams. 1 momme = 4.340 grams per square meter; 8 mommes is close to 1 ounce per square yard or 35 grams per square meter. The usual range of momme weight for different weaves of silk are. Habutai 5 to 16 mm. Chiffon 6 to 8 mm can be made in double thickness, i. Crepe de Chine 12 to 16 mm. Gauze 3 to 5 mm. Organza 4 to 6 mm. Charmeuse 12 to 40 mm. The higher the weight in mommes, the more durable the weave, and the more suitable it is for heavy-duty use. And, the heavier the silk, the more opaque it becomes. This can vary even between the same kind of silk. For example, lightweight charmeuse is translucent when used in clothing, but 30-momme charmeuse is opaque. The lower the weight in mommes, the easier to wrinkle and shrink. So it is the trends to use higher weight mommes even it is much more expensive. Silk has become a very popular feature in many mattress and bedding products in recent years. Silk cocoons are designed by Mother Nature to protect the baby moth from heat and cold, mildew, mould and mites. These desirable traits make silk one of the healthiest materials to incorporate into your bedroom. High quality silk products are made without the use of chemicals making silk a great natural choice. Silk is a natural fibre that is air permeable, and due to the content of 18 varieties of amino acid, it naturally absorbs humidity (drawing moisture away from your skin) which means you dont become sticky or wet during sleep. This can especially benefit people who suffer from rheumatism. Silk contains Sericin, an anti-acarid property that prevents the growth of mites and mold, making it a great choice for skin allergies. Silk is fungi immune and does not contain harmful trace chemicals and therefore resistant to mold and deterioration. Contains natural cellular albumen fibre. Silk contains natural cellular albumen fibre, a component that contributes to skin health by speeding metabolism of skin cells (decreasing aging of skin) and, coupled with the silk amino acid and permeability properties, contributes to the relief of joint pain, asthma, arteriosclerosis, neurodermatitis, and insomnia. Silk is a "natural" fibre. It does not "conduct" heat or static electricity; heat is retained during cold air temperatures and redundant heat is shed during summer temperatures (keeping you cool). Therefore, your body maintains its natural temperature. Silk sleep products feel light and airy, providing an ultra-luxurious feel. By vigorously rubbing the pile with your open palm. You will find that real silk feels warm, artificeial silk stays cool to the touch. Look at the ash and smell the smoke. If the material is cellulose (rayon), the ash should be soft and sticky, and the smell should be like burning paper (most paper is made of cellulose). If the sample is real silk, the burning sample should be black, crispy ash, and the smell should be of burning hair. How To Take Care Of Silk. Silk is a natural protein fiber, in the silk fiber there are 18 amino acids are the same as the humans skin, this is why when sleeping on it, people can feel very comfortable, cool, satisfied, calm, and can get a good sleep. Now more and more people are trying to use silk bedding, and once they tried on it, they will not come back to the cotton or other fiber bedding. They will have it for life time. Has done a lot to make sure the washing of our silk bedding is an easy thing, please follow up the following washing instructions, and then you will find the silk is actually a strong fiber, you can use it for a long time. We have tried many ways to reduce the shrinkage of our silk fabrics, before cutting we checked the shrinkage. The maximum shrinkage of our products are 3%, in this way, when our consumers water wash the silk bedding, it will not mis-shape. So please just water wash it either by hand or by machines. But still suggest to wash the similar color products together. Silk is surrounded by the silk sericin, the inside of the silk is silk filament. Silk sericin is the major reason why the silk is very easy to get crinkled. Traditionally people thought there are 24 % silk sericin and 76% silk filament, but actually the experts discovered inside the 76% silk filament there are still 11% silk sericin, which is very difficult to remove. But we did remove the 24% outside silk sericin and 11% inside silk sericin. This is why our silk beddings can still keep a good shining, and less crinkle after washing. The protein fiber is like our skin, it can not afford hot water and strong alkali. These are the major characters of the silk, and consumers should pay very clear attention to this point. So when water wash the silk bedding, please do not use water with more than 40 degrees, please do not use alkali to wash or to bleach, the alkali can melt the silk, not only hurt their strength. When it is really necessary to wash it with alkali to remove special dirts, consumers can still do it, but after applied alkali, please wash it with water for several more times, to make sure there is not remains of alkali stayed on the silk, we suggest to use acid stuff, such as vinegar to wash and balance the alkali. To tumble dry the silk bedding in your machine, but still use low temperature, when it is 80% dry, please take it out and iron it. You can iron it with 150 to 200 degrees but please do not stay your hot iron on the silk for more than 5 seconds, always move the iron, so the silk will not be hurt. Please move the iron along the warp direction if you can distinguish which side is the warp. This will increase the shining effect of the silk. We suggest our consumers try to avoid the dry clean, for several reasons: it is expensive and not convenient, it is also not healthy, because the dry clean shop will use chemical to wash the silk, it might hurt the silk and the chemical remains on the silk bedding from their chemical dry cleaning might cause any trouble to the healthy of our consumers. Sisters-silk located in Hangzhou city, Zhejiang province, China. Hangzhou reputed as the " SILK COUNTY " of China, is the main silk production area and has long history of silk development. That's why the China National Silk Museum also seats in this city. We have our own factory, design and sales department. We have massive ready goods. Our mission : Quality first, reputation first, service foremost, seek to be the Best. We provide GORGEOUS AND FIRST QUALITY silks. Silk Beddings, including nobler and rare seamless silk beddings in 16 momme and 19 momme, regular silk beddings made of 16 momme, 19 momme, 22 momme, 25momme, 30 momme, and Jacquard silk in different patterns, we could do special size as your request. Silk Sleepwear, including chemise, Lady and men's pajamas, robes, all in US size with various sizes/colors. Silk Underwear, all in US size, with silky shine, soft and smooth, extremely desirable. Silk Clothing, all in US size, with fashionable style, quality assured. Silk Accessory, silk scarves and silk handkerchief, in more than 30 colors, can be made as your special demensions request. Lady's silk long johns set. Men's silk long johns set. We only produce and sale 100% genuine silk products!! Inspection report by Hangzhou city. We always strive for high quality products and excellent customer service, your easy shopping here and satisfaction are the most important thing to us. The item "4 pcs Seamless 19mm 100% Silk Duvet Cover Fitted Sheet Pillowcase Set All Size" is in sale since Thursday, April 24, 2014. This item is in the category "Home, Furniture & DIY\Bedding\Bed Linens & Sets\Bedding Sets & Duvet Covers". cn" and is located in Hangzhou, Zhejiang. This item can be shipped worldwide.